Pledge 3, How it works! PUT YOUR NAME AND ADDRESS IN THE UPPER RIGHT CORNER. LINES 1 - 3, FILL IN WITH A FULL NAME AND AMOUNT OF A FRIEND, FAMILY OR CO-WORKERS PLEDGE OF FINANCIAL CONTRIBUTION. Once all your pledges have been received that match your form. Your eligible for different levels of fun begin! Everyone with a completed Pledge 3 form will know the feeling of assisting others, both pets & people! Everyone with a completed Pledge 3 forms will be placed on our newest page "Active Participate", this page will host on the very front of our website. Here we will be show casing your abilities and just how easy it is to get involved with an organization and to make a difference in the lives of pets. 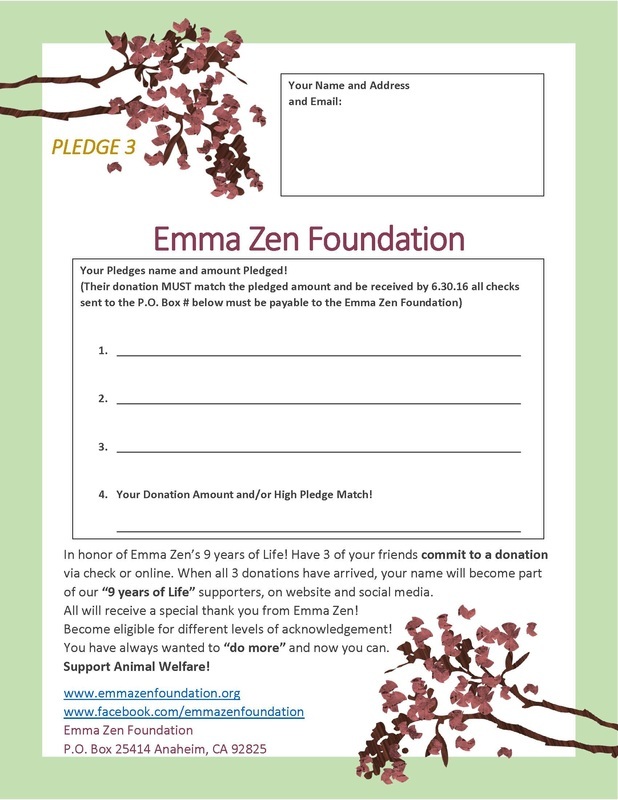 Everyone with a completed Pledge 3 forms will be receiving a special "Thank You" from Emma Zen herself! Those that gives themselves or matches a donation will be put into the running for a gift card! ($50.00 value) As the success of this fundraiser changes so does the amount or number of gift cards available! ​If you have more then 3 friends, then we invite you to fill out another form! Extra points for multiples!!!! You will still receive the top 2 bullets from our first section of achievement.